This edition applies both terminology from and an analytical framework based on the International Classification of Functioning, Disability and Health (ICF), to generate five impairment classes which permit the rating of the patient from no impairment to most severe. A diagnosis-based grid has been developed for each organ system. The grid arranges commonly used ICD-9 diagnoses within the five classes of impairment severity, according to the consensus-based dominant criterion. Functionally based histories, physical findings and broadly accepted objective clinical test results are integrated where applicable to help physicians determine the grade within the impairment class. The result is a decision that is both transparent and reproducible. Learn to correctly apply the principles of the Guides to the Evaluation of Permanent Impairment sixth edition, with this must-have companion book. 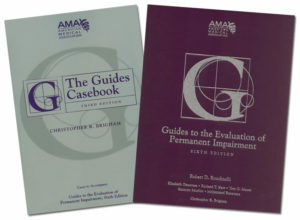 More than 70 in-depth cases cover an array of different systems and diagnoses, mirroring the chapter organization of the Guides Sixth to promote ease of use.